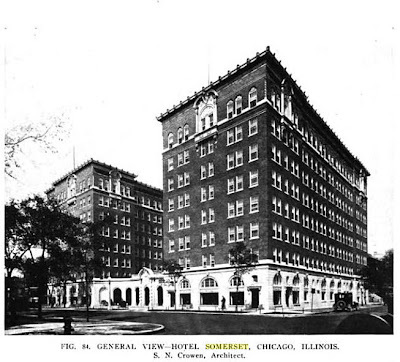 Special thanks to Tom Matthews for giving us the heads up on these great images of the Somerset Hotel, located at Argyle and Sheridan. (Now Somerset Place.) 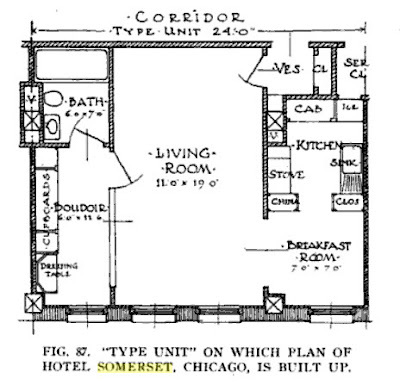 They are from The Architectural Record, volume LI, 1922. The first thing you're going to notice is the loss of all the terracotta elements that once graced the entrance. It broke our hearts to see it. Below the first image, we've pasted in the same view from today, as taken by Google Street Views. (If the image doesn't show up, go to Google directly. 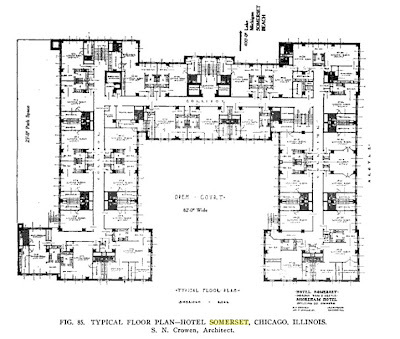 The Somerset was designed by S. N. Crowen. 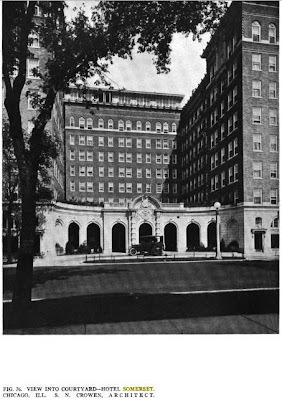 Click on the links below the article to see more great images of this gorgeous Uptown building. 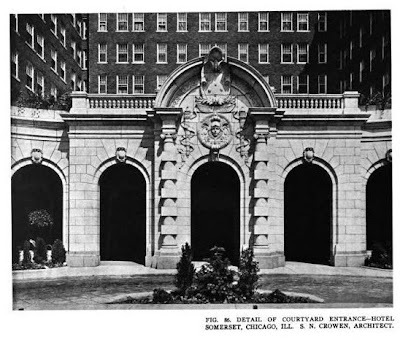 It's sad to think we lost that ornate entrance. It's even more sad to see the state of that building today. It is in dire need of rehab. The entrance is still covered in peeling paint (just like the google street view). The same goes for the Sheridan Plaza at Wilson and Sheridan. It has been encompassed in scaffolding for so long now because the building is crumbling and there are no funds to repair the building, so it sits. Sad. If you look, they're actually updating the facade as we type/read/what have you! I'm sure it'll be nowhere as ornate, though. In other news, i love how they refer to part of the living space as a "boudoir"! hispterhomo--I hadn't even realized they were updating the facade; thanks for pointing it out! Unfortunately, the facade update doesn't look like a restoration. It looked briefly like they were going to restore the ground floor facade, but instead now it looks like they're just resurfacing it with a skim coat of brick & mortar (just 1/2" thick bricks stuck on). Hopefully though the building can eventually be renovated & restored someday in the future. My husband and his partner toured this property last week. Let me begin by saying, not all developers have green scales for skin and only one motivation. We proudly have a long resume of historic preservation and would like to see this property regain some of it's original grace. What (as a community) would you like to see this building become? (as part of my research I'm looking into if I think I could find someone to do a CAFETERIA...no joke, they were all the rage in 1920's and there was one in the building originally!) Cool or not? Obviously a new, more thoughtfully planned facade is a must...sadly it would take a lot of resources and a lot of time to recreate the terra cotta facade that once was there...an eventual goal perhaps. PS. this is of course NOT a "done deal" at this stage in the game. I for one would like to see the ground floors restored to their original glory, not in terra cotta, which becomes brittle with age, but with a fiberglass substitute as used in many other restorations.